Penn Community Bank is proud to announce that it has donated more than $83,000 to United Way of Bucks County, raised during its 2018 company-wide support campaign. 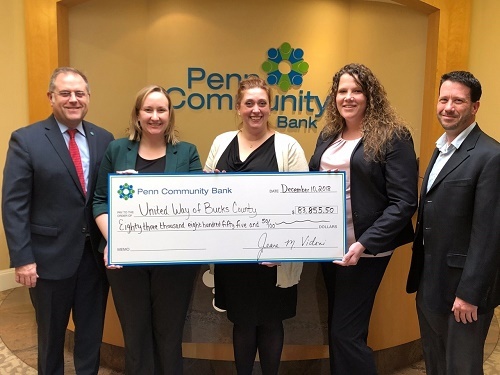 Penn Community Bank’s more than 325 employees, executives and directors raised $58,855.50 through a variety of programs and activities held throughout the year. The bank then matched $25,000 worth of contributions, bringing the final total donation to $83,855.50. The mission of United Way of Bucks County is to improve lives by mobilizing the caring power of communities to advance the common good. It focuses on three key issues: access to a high-quality education, a stable income and good health. The donations from Penn Community Bank help the organization to feed the hungry, give the homeless a path home, help seniors and families in crisis, and give at-risk young children access to care and education. PHOTO CAPTION: Penn Community Bank raised $83,855.50 through its 2018 annual campaign to donate to United Way of Bucks County. Presenting the check are (l to r) Todd Hurley, Chief Relationship Officer of Penn Community Bank; Kirsten Palmieri, HR Business Partner and United Way Campaign Coordinator for Penn Community Bank; Marissa Christie, President & CEO of the United Way of Bucks County; Jessica Sweeney, Corporate Administrative Manager and United Way Campaign Coordinator for Penn Community Bank and Matt Uhler, Director of Resource Development & Impact Director for Financial Stability for United Way of Bucks County.